European Burmese reminds by its appearance the real mysterious east princess who knows its own worth and able to show all beauty and love to close people. When you look into its clever, orientally mysterious eyes you understand that all secrets of the Universe are revealed to this cat. In general, the Burmese cat is full of riddles and contradictions. It is like a precious pearl. Everything is in there. And nothing extra. The beauty of European Burmese isn't evident immediately, as for example scandalous sphinxes or exotic Bengalians. But, if you stop and look at this cat more attentively... Actually - it is necessary, that this cat has looked into Your eyes. And all will begin with these eyes. The inquisitive, clever, confident sight of its honey-amber eyes will touch your soul. You never meet a Burmese cat with an empty tired sight, with the malicious offended eyes or a silly absent look. Undoubtedly, eyes - a mirror of soul of this cat and a way to your heart. Burmese cats adore people. And, if there is any hierarchy, the person, certainly, on the first place. With it it also reminds a dog and so differs from other cats. The plasticity of Burmese is imperial: it moves easily, freely the way its wild relatives do— leopards, jaguars. They are equally graceful at a rest, and in movement. Frolicing Burmese is a high ballet, show of a plasticity and the cat's perfection. The powerful muscles lift Burmese in air vertically on height of your growth. Burmese is able to soar up without visible muscles pressure and also softly land, absolutely the way the dolphin-swallow does it. Burmese wonderfully relaxes, lying on your hands, becomes trustful, gentle and soft. And if it wants to be released from your embraces, it follows from your hands as mercury. European Burmese. It is possible to judge according to its name that it is one of the most popular types of Burmese in Europe. Besides, cats of this type are actively breed in Australia, New Zealand, Southern Africa and America. Initially the Burmese the breed originates from America (see the section about the breed history). Later, in 1949 the breed gets to England. The work on breed proceeds there that is built with addition of other breeders who are different from the American. In Europe, longer than in America addition of other breeds to Burmese proceeded, such as Siamese. For this reason European Burmese has more colors, than American, because of addition and recognition of red color in breed (during the period from 65-75), and accordingly the tortoise. After many years breed has changed so much outwardly that it began to be considered as a separate breed. In the majority of phelinological organizations the copulations between American and European Burmese are forbidden that allows to keep and underline the pedigree uniqueness by competent breeding cultivation. Similar division reflects not only morphological distinctions between two types, but also history of breed development. 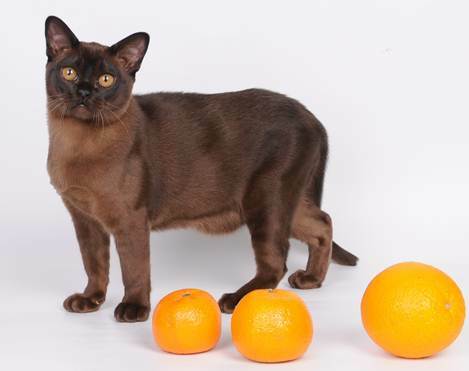 Having won the hearts of cats fans in England and Europe, Burmese cats in early fifties got to Australia where they won general love and became the most popular breed among all short-haired. 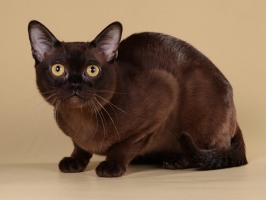 Australian Burmese cats are more thickset and heavy animals, with a roundish head and soft roundish lines in all shape, they have color of eyes brighter, sated and not growing dull with the years. For this reason now this type is very popular in Europe and many breeders add cats of these lines in their breed programme. In several exhibition systems (for example, the American system CFA, CCCA) American and European Burmese are different breeds, and refereeing passes under different standards. In other systems (for example, WCF, TICA) refereeing passes under one standard. In some systems standards are similar, in some they have essential distinctions that frequently causes many problems as it is very difficult to compare cats of absolutely different type in one standard. 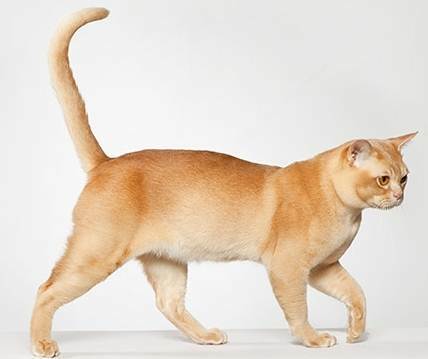 For this reason, European Burmese breeders prefer to expose the cats on the European system FIFE in which refereeing passes under standards of European Burmese or on the American system CFA where European and American Burmese are divided into 2 breeds and have legal proceedings under different standards. Since May, 2011 division of Burmese into two breeds in system ACFA will be officially accepted, and accordingly refereeing will pass under two different standards. According to standards of International phelinological federations (FiFe) there are only 10 colors of Burmese: brown (BUR n), chocolate (BUR b), blue (BUR a), lilac (BUR c), red (BUR d), cream (BUR e), tortoise (BUR f), chocolate tortoise (BUR b), blue tortoise (BUR g) and lilac tortoise (BUR j). For all colors the irregularity of color intensity is characteristic. The head, paws, tail and back are slightly more dark. From back to stomach the color gradually brightens. The neck and breast also should hardly be lighter than the basic tone. Young animals are born very light. The color is formed in process of growing of a cat. By the way the fur structure undergoes gradual changes too and is definitively formed, however, as well as the color up to 1 - 1,5 years. All colors possess special unique charm. At Burmese the reaction of quick temper to fear and various stressful situations is almost shown to a minimum. However, being seldom aggressive with people, Burmese cats can protect themselves not bad in a fight with other cats even if they are larger than them. Burmese are known as «clowns in the world of cats '» and even having matured, remind kittens, thanks to the enthusiasm and curiosity. Very gentle, friendly, they perfectly get on with children, dogs and other cats and twhat is important, it is very convenient to travel on the car with them. Probably, such features of Burmese behavior are connected with the fact that the development instinct, along with vital and zoosocial instincts, is most developed in them. Burmese feel any deviations of your bioinformation energy field and are capable to correct it. Magnificent healers. As a matter of fact Burmese are not only friends, but also the live indicator of your mood and a state of health. It is worth to notice that this feature is characteristic for all cats, however at Burmese it is very developed. For this reason cats always feel and endure any quarrels, scandals together with you. The sound set of Burmese speech has a low tonality and reminds puffing, grunting, they like to air with closed mouth, uttering a sound "m", instead of "mew". In a good mood the Burmese will exchange a couple of words with you, and it will live the grieves over with silent purring. The regal shape of this cat is unique. It is possible to talk about magnificence and force, beauty and plastic of its body. Burmese eyes deserve special attention. They have the special expression which has become the distinctive feature of the breed – a bit "angry", sharply contrasting with their live and sociable character. Color of eyes - radiant and bright, all shades of yellow from chartreuse to amber, but the golden-yellow is preferable . Form, size and holding play bigger role for Burmese expressions, than color. At elderly cats clarification of eyes` color is accepted. Intensity of color grows dull, at the age of 2-3 years. 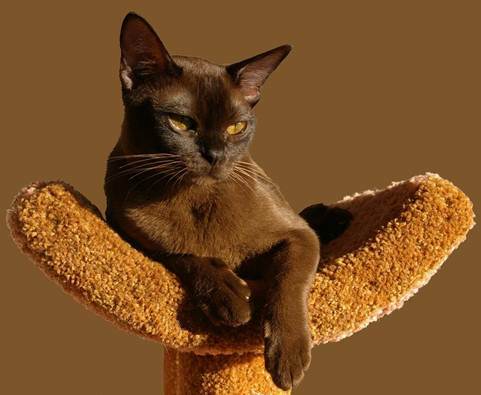 It is necessary to notice that the color of the eyes of Burmese cats can strongly change depending on intensity of illumination, a light source – solar, from an electric lamp, a daylight and from mood of a cat. Standards recommend for experts to estimate color of eyes of Burmese cats, necessarily bringing them to a window, and it is considered that the best light reflects from a surface of snow in winter day. Burmese fur also deserves a separate mention. At first a little about its structure. It should be short, thin, without an underfur. Touching it, the hand feels silkiness, heat and extraordinary softness of expensive velvet. It densely adjoins to a body of a cat, changing a shade at the slightest fluctuation of strands of fur. 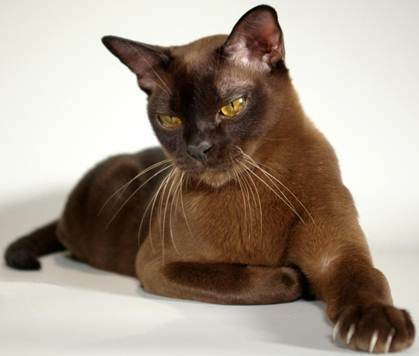 Fur of a well-groomed Burmese cats should be shining and sparkling, to cast luster and glaze. On the sun, at movement of the animal each hair gets "special Burmese shine". And from the first touch to it you would never forget the pleasure. It is possible to tell with confidence that Burmese breed has already won hearts of many and became popular in Russia as cats of this breed possess all external and internal qualities making them an ideal pet for keeping in a family, an ornament and pride of any house. These clever, benevolent, socially focused animals can't bear loneliness and a lack of attention from owners. All their cat's happiness consists in your love, understanding, respect of their cat's advantage. Protect and cherish the pupils, and they will love back, with affection and tenderness! In the conclusion, I wish that more people have learned this fine and surprising breed - European Burmese! Denisova M. An article "Burmoteraphy"